Jun. 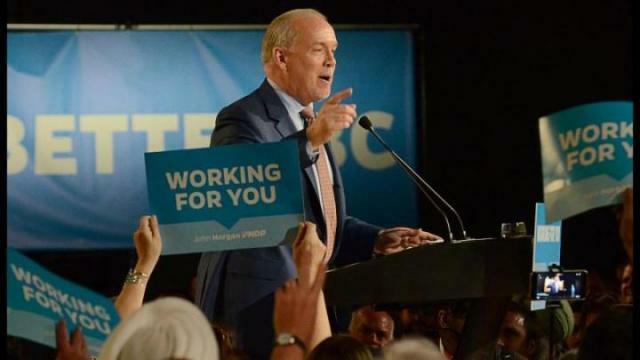 30, 2017 8:30 a.m.
As B.C.’s new premier-designate, it might be useful to know a thing or two about NDP leader John Horgan, and the promises the NDP and Greens have made. Born in 1959 and raised in Victoria, the youngest of four children. Father died of a brain aneurysm when he was 18 months old. Earned a bachelor of arts degree from Trent University in Peterborough, Ont., and a master of arts degree from Sydney University in Australia. Horgan was diagnosed with bladder cancer in 2008 and was later declared cancer-free after surgery and treatment. Was was first elected MLA for Malahat-Juan de Fuca in 2005 and re-elected for Juan de Fuca in 2009 and 2013. Acclaimed party leader in 2014. Married his wife, Ellie, in 1984. They have two sons, Nate and Evan. The legislature would be recalled within one month of the swearing in of an NDP government. A referendum on proportional representation will take place in the fall of 2018, concurrent with the next municipal elections in the province. If it is approved, proportional representation would be used in the next provincial election. The parties agree to work together in good faith to consult British Columbians to determine the form of proportional representation that will be put to a referendum. The NDP and Greens will actively campaign in support of the system of proportional representation that is agreed on. Legislation would be introduced in the first sitting of the legislature to ban corporate and union donations and contributions from non-residents of British Columbia to the province’s political parties, as well as placing limits on individual contributions and conduct a review of campaign finance and the Elections Act. The fixed election date would be moved from May to a date in the fall, starting in 2021. Set up an arm’s-length commission that will be tasked with “establishing a pathway” to a minimum wage of at least $15 per hour and overseeing regular rate reviews. Create an emerging economy task force to address the changing nature of business over the next 10 to 25 years. Establish an commission to support innovation and business development in the technology sector, and appoint a commissioner with a mandate to advocate on behalf of the province’s technology sector in Ottawa and abroad. In its first budget, the NDP would develop a proposal to implement an essential drugs program, designed to reduce the costs of prescription drugs and ensure the cost of drugs is not a barrier to health management. Invest in home care to enable seniors and other people who need assistance to stay in their own homes. Make housing more affordable by taking action to deal with the speculation and fraud that the NDP and Greens say is driving up prices.